Saturday, July 4, 2009. A relatively quiet Independence Day for the US. The Statue of Liberty crown reopened after being closed for 8 years due to the attacks on the World Trade Center. North Korea tested ballistic missiles of their own to rattle the saber of their military at the United States, but nothing extraordinary. Seemed like it would be just another quiet celebration of America's Independence. At 1:35 p.m., a man named Robert Gaddy called 911 and reported finding two bodies in a residence at 105 Lea Avenue near downtown Nashville, TN. A 300-plus pound lineman for the Nashville Kats Arena Football Team, Gaddy was known around town as "Big Daddy Gaddy." He is perhaps most well-known for being a friend and teammate to NFL legend and local hero, Steve McNair. 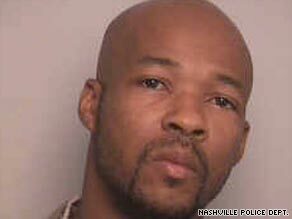 Related: Read about the Horrifying Murder of Janet March Right Here in Nashville. The first officer appeared just four minutes later, at 1:39 p.m, and found that one of the victims was the former football star. The other appeared to be a woman, whose dead body lay at his feet on the floor of the living room. The man turned out to be Steve McNair and the woman his girlfriend, Sahel Kazemi. McNair sat on his couch, Kazemi on the ground at his feet. The officers found two bullets in the walls almost immediately; one was attributed to McNair, the other to his girlfriend. The 9mm used in the murder-suicide was then found underneath Kazemi's head during the investigation. This isn't a sports blog, so I won't spend a whole lot of time writing about Steve McNair's career, but here are the highlights: he won the Walter Payton Award in 1994 and was drafted by the Houston Oilers the next year. He didn't really become a superstar player in the NFL until the Oilers migrated to Nashville and became the Tennessee Titans. He participated in the Titans' lone Super Bowl, losing that game by about a foot-and-a-half. (Sorry if this is triggering you, the long-suffering Titans fan.) He took the Titans to a few more playoff appearances before being traded to the Ravens in 2005. He played a few more seasons and then retired in 2007. Related: 5 of the Most Gruesome and Bizarre Nashville Murders I remember intensely respecting his on-the-field heroics. He was tougher than most quarterbacks, and he put a nice touch on his passes. Being a Falcons fan, though, I never followed 'Air' McNair's career with the fervor that I would now. His personal life plays much more of a role in his ultimate death than his football career. First of all, he was married, and many of his friends were surprised to know he was involved in a secret relationship with the waitress, Kazemi, before his death. He had two sons with his wife, Mechelle McNair and two sons by two other women. Remember Robert "Big Daddy" Gaddy? Turns out, even though he made the initial 911 call, he was not the person who discovered the bodies. That distinction goes to one Carless Wayne Neeley, a friend of McNair's who co-rented the property at 105 Lea Avenue with the former football star. July 4th, at approximately 12:40 p.m., Neeley dropped by the residence and saw McNair's cars parked outside. He had been talking to McNair about speaking at a local Little League game and figured he would drop in to ask about it. He unlocked the doors and went inside. He saw the both of them in the living room but thought they were asleep and walked right past them into the kitchen. He grabbed a beer from the fridge and returned to the living room. Upon seeing blood and shell casings in the condo, he fled the residence. He said he didn't recognize the victim on the couch as McNair and tried multiple times to call the former football player. When he couldn't get ahold of McNair, he did the next best thing: He called McNair's best friend, Gaddy, who showed up 15 minutes later. Gaddy and Neeley went inside and identified McNair's body, but here's the weird thing: they didn't go outside and immediately call the police. First, they called General Sessions Judge Casey Moreland. Moreland, of course, told them that they should call the authorities and admit to everything they knew. A thirty-three-year-old convicted murderer named Adrian Gilliam sold Sahel Kazemi the loaded 9mm pistol she would later use to murder Steve McNair and kill herself. He purportedly wanted a romantic relationship with Kazemi and exchanged 49 texts and phone calls in the days leading up to the murder. He later stated he sold her the gun because she'd told him she was worried about prowlers in the area. However, it was also speculated that she was angry over the possibility that McNair was engaged in other extramarital affairs, in addition to the one he was having with her. Despite that, she was also purportedly seeing other men at the time, including one of McNair's former teammates on the Tennessee Titans and a Vanderbilt University football player. Kazemi is pulled over for DUI in Nashville while driving a Cadillac Escalade registered to both McNair and Kazemi. McNair and Vent Gordon, the chef at one of McNair's restaurants, are in the car at this time. McNair refuses to get out and talk to the police, but he still bails Kazemi out of jail. Weird irony: the officer who arrests Kazemi for DUI is the same one who, six years earlier, arrested McNair for the same charge. Later that evening, Sahel Kazemi purchases a 9mm pistol from a convicted murderer she met while trying to find a buyer for her Kia. (Wikipedia) There is also speculation that Kazemi was with her ex-boyfriend, Keith Norfleet, in the hours following being bailed out of jail for DUI. 10:05 AM -- Kazemi texts McNair. "Baby I might have a break down im so stressed." She also states she needs to pay "the cell phone bills n the hospital." 04:00 PM -- McNair tells Kazemi that $2,000 is being transferred to her account. She later texts that she "can hardly breath [sic]" and "I just want the pain in my chest to go away." McNair texts back, asking if she would like for him to see about her. 04:04 PM -- Kazemi texts McNair: "Baby I have to be w u 2nite. I dnt care where." 08:34 PM -- Kazemi again texts McNair: "baby where u gonna be at when I get off." 11:00 PM -- McNair puts his children to bed. 12:38 AM -- McNair texts Kazemi: "On my way." [Presumably, this is the condo where the two of them met up.] 01:14 AM -- Kazemi tells McNair the door is open. 02:23 AM -- There is one more text sent to McNair's phone at 2:23 AM. "im going to the store." It was sent approximately 23 minutes after the Metro Nashville Police Department believes Kazemi killed Steve McNair and then herself. According to Sammy Saltman in a 2009 article, "T-Mobile Subpoena Compliance Specialist Melanie Cadwell told Nasvhille authorities that it is possible this message, which was received by McNair's Blackberry at that time, was delayed in transit, and was actually sent earlier. Although the official investigation into Steve McNair's death seems pretty conclusive, a few lingering questions remain. Former police officer Vincent Hill believes Kazemi did not, in fact, murder McNair and turn the pistol on herself. His main evidence comes from the fact that McNair, who very often carried thousands of dollars rolled up in a rubber band, only had $6 in in his wallet when his body was found. A more minor but nevertheless credible point relates to Adrian Gilliam's uneven testimony. Gilliam claims that he avoided the truth in his initial interviews because his fiancee was present, and he didn't want her to know about his amorous intentions with Sahel Kazemi. We can't really cast aspersions on Gilliam purely for his past, but it wouldn't surprise me at all if he had something to hide about the whole murder/suicide. The last point Vincent Hill brings up is that Kazemi purportedly hated guns. I mean, honestly, that doesn't really matter, since plenty of violent ends have come at the hands of people who abhorred violence, but it is definitely an avenue worth exploring. Kazemi's family has requested the investigation be re-opened, and though I doubt that will ever happen, it doesn't hurt to think about all of the angles in this case. The more I've read about Steve McNair's death, the more tragic the whole thing seems to become. I've got to admit, I first thought the whole case had to do with a jealous lover and revenge. Now that I've paid some actual attention to it, I have to admit it just appears to be a horrible, random, absolutely senseless crime. Steve McNair was no worse than any other professional athlete, and he appeared to have a really quite generous streak that set him apart. From what I've read, he was a good man, an absolute legend, one who embraced Nashville with the whole of his life. Sahel Kazemi didn't have a chance to establish herself, so the legacy she leaves behind is tied almost exclusively to her tumultuous relationship with Steve McNair. However, the horrors associated with the events of July 4, 2009 can't erase the joy she brought to friends and family. She very obviously suffered a psychotic break, which may explain what eventually happened in the wee hours of her final night.